Alfredo Costa Monteiro lives and works in Barcelona since 1992. He plays accordion, electric guitar and turntable. In 1992, he finished his studies at the Fine Art School of Paris, where he gets his degree in sculpture / multimedia. 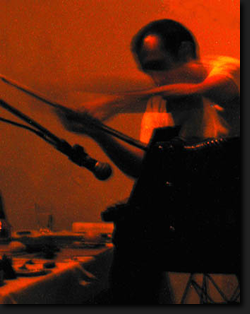 Apart of his work as a visual artist, he starts to become involved in improvised music from 1995. Since then, his work stands somewhere between visual arts, visual-sound poetry and sound. His installations and sound pieces, all of a low-fi character, have in common an interest for unstable processes, where the manipulation of objects as instruments or instruments as objects has a strong phenomenological aspect.